I gave birth to micro preemie twins at 25 weeks without warning: A baby boy named Asher and three minutes later, a baby girl, Abagail. We learned that our newborn daughter had suffered from a pulmonary embolism and was given a 2 percent chance to make it through the night. Though she made it, we were soon informed that she now suffered a bilateral grade III/IV intraventricular hemorrhage, a brain bleed. On her 80th day in the neonatal intensive care unit (NICU), the radiologist grew concerned that her head was growing abnormally. We had never heard the word “hydrocephalus” until then. Our neonatologist advised us to transfer Abagail out of the only home she knew, away from her twin brother, to get an MRI at Children’s National. We agonized over the decision, but away in a speeding ambulance went my barely 5-pound daughter. Shortly thereafter, we were introduced to Robert Keating, M.D., Chief of Neurosurgery at Children’s National Health System. I always joke around with Dr. Keating and tell him if he wasn’t a doctor he would be a rock star. 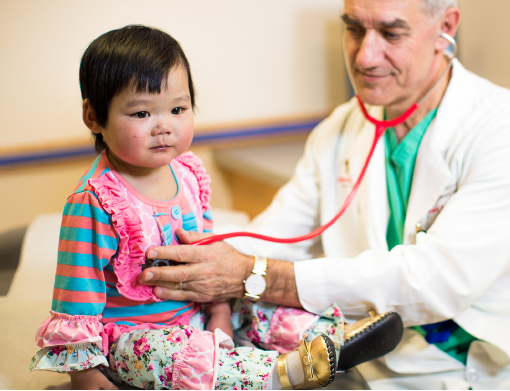 He has this presence about him, this look in his eyes and a way of connecting on a personal level that makes the scariest scenarios seem — well, like he is on your team, so it will be OK. Dr. Keating is the captain of Team Abagail at Children’s National. Thankfully, his entire team, the other neurosurgeons, physician assistants and the amazing five east nurses go above and beyond to make sure Abagail is well and our needs are met. The best advice Dr. Keating ever gave me was to stay off Google. He encouraged a second opinion and assured us Abagail was in no immediate danger. The two neurosurgeons we consulted concurred with Dr. Keating. Abagail’s initial shunt placement surgery was on March 5, 2012. Since then, she has endured an additional 11 shunt-related brain surgeries, many related complications and multiple lengthy hospital stays. I often joke with Abagail, saying, “I know Children’s National is a teaching hospital, but stop teaching them new things.” I should be telling her to teach them things that do not involve the need for anesthesia and scalpels. After learning more about the condition at a Hydrocephalus Association Conference, I had no choice but to become involved in the organization. Every day is hydrocephalus awareness day for me and I will do everything humanly possible to improve Abagail’s quality of life. Although I am grateful for every second of my journey with her, I am also frustrated beyond words that there is no cure — the only treatment is brain surgery. This fuels my drive to first advocate and then raise funds to go towards research and development. For me and my family, hydrocephalus is the continued search for a silver lining. Every day is a new day not to be taken for granted. To all the families who are in the same situation, just know that you are not alone. No matter what you’ve been through on your journey, there is someone else who has been there who can hold your hand, lend a shoulder or provide the punching bag and gloves.